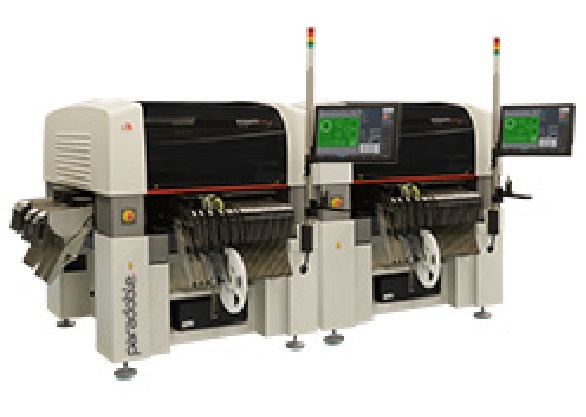 The Para Doble defines a new standard of highly flexible SMD pick & place machines. Drive technology, materials, vision system and software have been developed especially for this machine and are trend-setting. The Para Doble combines to Paraquda machines in one: A chip placer, a fine pitch placer, an odd-shape component placer and a dispensing machine. The Paradoble offers unmatched changeover times, the highest number of feeder slots per square meter in the market. Intelligent kitting without production stop and the ability to combine placement, dispensing and component verification all in one. Thanks to the easy integration with modern ERP and production planning systems the Paradoble is the ideal equipment for high mix production with ever changing production schedules.